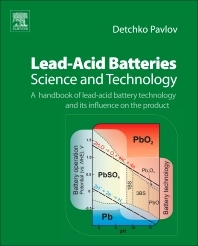 Lead-Acid Batteries: Science and Technology presents a comprehensive overview of the theory of the technological processes of lead-acid battery manufacture and their influence on battery performance parameters. It summarizes the current knowledge about the technology of lead-acid battery production and presents it in the form of an integral theory. This theory is supported by ample illustrative material and experimental data, thus allowing technologists and engineers to control the technological processes in battery plants and providing university lecturers with a toll for clear and in-depth presentation of the technology of lead-acid battery production in their courses. The relationship between the technological processes and the performance characteristics of the batteries is disclosed too. Detchko Pavlov is Professor of Electrochemistry and, since 1997, Full Member of the Bulgarian Academy of Sciences. He is one of the founders of the Central Laboratory of Electrochemical Power Sources (CLEPS) (now IEES) at the Bulgarian Academy of Sciences and has been Head of the Lead Acid Batteries Department at this Institute for over 45 years since its establishment in 1967. His major scientific achievements are in the field of electrochemistry of lead; disclosing the structure of the lead and lead dioxide active masses; elucidating the mechanism of the processes involved in the technology of lead-acid battery manufacture and operation, as well as of the oxygen cycle reactions in VRLAB. His recent research efforts have been focused on evaluation of the effects of carbon additives to the negative plates and identification of the mechanism(s) of their action.